In the hilly landscape of Mondulkiri province in northeast Cambodia, the Phnong ethnic group accounts for up to 80% of the total population. The Phnongs depend on self-sufficient agriculture for their livelihoods. Their main product is upland rice for household consumption. However, they often suffer from shortages in its production. Thus, tree resin is very important to them as a major source of acquiring cash, especially during times of rice shortage. Holding rights over resin trees are transferred through generations, based on their system of customary tenure. Resin extracted from Dipterocarp trees (Dipterocarpus sp.) is collected and sold to middlemen for manufacturing paint, making boat sealant, making torches or varnish. 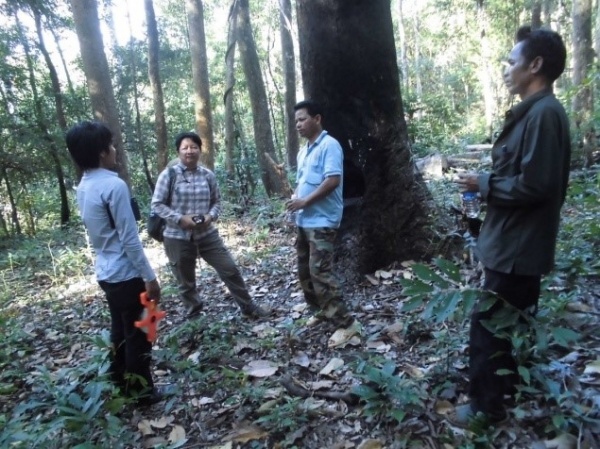 However, expansion of economic land concession (ELC) for rubber and other agricultural crops in the province, along with illegal logging, have become threats to the Phnong’s resin trees. To understand the causes and effects of the decrease in resin trees upon the Phnong’s livelihoods and ways in which they cope with this challenge, on-site observations, semi-structured interviews and focus group interviews were conducted with resin tappers, resin traders and community leaders in two villages in Mondulkiri between November 2014 and August 2016. Results showed that the average number of resin trees per household varied from 30 to 250 trees. The number of resin trees owned was proportional to the amount of income generated from resin, varying largely from USD 125 to USD 1,620 annually. The main threats to resin trees were found to be the overlap of lands containing stands of resin trees with ELCs and illegal logging. 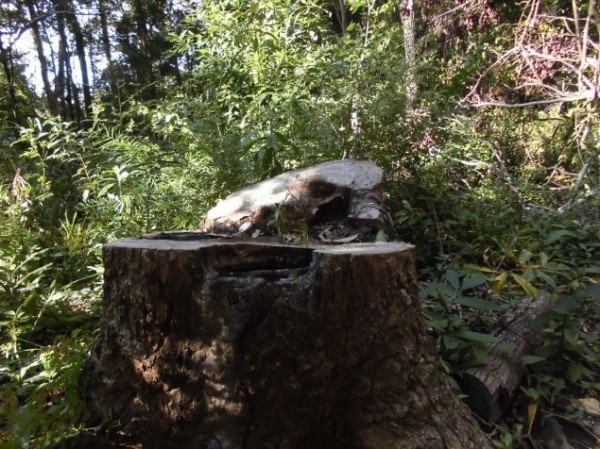 As a result, some households that lost resin trees reported income decreases ranging from 20 to 60 percent compared to times before such threats arose. The solutions that have been recently attempted in tackling the challenges include expansion of farmland, finding labour work, bringing cases to authorities, and increasing the frequency of forest patrols. Some villagers even became illegal loggers themselves. Sustainable solutions proposed to support villagers in coping with these challenges include gaining legitimate rights and ownership over resin trees, building the capacity of community forestry members, involving stands of resin trees in REDD+ or carbon mitigation programmes and increasing agricultural productivity to enhance food security. Mondulkiri province, located in the northeast of Cambodia, is 375 kilometres from Phnom Penh. The geographical character of the province is undulating uplands, mostly covered by forests with some lowland valleys. In the hilly landscape of the province, the Phnong ethnic people account for up to 80 percent of the total population. In 2009, the forest areas of the province covered 1,311,589 hectares, while cultivated land areas covered 117,211 hectares. Although rich in biodiversity, the province remains one of the poorest in the country (CDHS 2006). The government has taken steps to protect the valuable forests of Mondulkiri since the 1990s to conserve biodiversity. Forests in Mondulkiri comprise of a range of different forest types: deciduous dipterocarp forest, semi evergreen forest and bamboo forest (WWF-Cambodia 2016). These forests provide habitats for fauna and flora, together with economic benefits and ecosystem services such as habitat provision, carbon storage, pollution reduction and provision of non-timber forest products (NTFPs) (Watkins et al. 2016). Mondulkiri forests are not only a home for endangered and critically endangered and iconic megafauna such as the Asian elephant (Elephas maximus), tiger (Panthera tigris), leopard (Panthera pardus), Eld’s deer (Rucervus eldii), Dhole (Cuon alpinus), and Siamese crocodile (Crocodylus siamensis), they also play a vital role as a safety net for the Phnong, who heavily depend on non-timber forest products for their livelihoods. However, despite their protected status and their importance for biodiversity in Cambodia, the forests of Mondulkiri have experienced massive losses due to logging, cash crop farming, agro-industrial plantations, and high immigration into the area, all of which have generated large-scale land clearing leading to deforestation (Kamnap & Sambat 2009). The population of Mondulkiri is 56,443 people of 12,149 households (NCCD 2008), with 83 percent engaged in agricultural activities, mainly rice production. The Phnong depend on self-sufficient agriculture for their livelihoods. The main product is upland rice for household consumption. However, the Phnong often suffer from shortages in production due to low inputs and lack of irrigation systems. Thus, non-timber forest products, especially resin, are very important to them as a main source of cash during periods of rice shortage (Evan et al. 2003; Luu & Pinto 2007; Baird 2009; Tola 2009). Besides providing the resin that supports the locals’ livelihoods, the Dipterocarp tree contributes to ecosystem services in several ways. For example, its cauliflower-shaped crown lowers wind speed, its flowers produce nectar which is the food of pollinators, and its seeds are food for rodents and other terrestrial animals (Corlett & Primack 2005). Likewise, ectomycorrhizas association of the Dipterocarp not only increase the absorptive efficiency of the roots of the host plant but also increase soil nutrients that benefit the understory of the resin tree stands (Lee 1998) (Figure 1). Traditional resin tapping practices are harmless for the forest as the resin tapper avoids causing fire during tapping activities, and tapping is conducted only for certain species (Luu & Pinto 2007). A resin tapper chops a tree’s trunk making a backwards-sloping hole from 0.4 to 1.0 meter above the ground. Seven to ten days later, for the first time the tapper comes to harvest the oleoresin exudated from the woody vascular and stored in the hole. Then, the oleoresin remaining in the hole is used as fuel to burn the surface of the hole for two to three minutes to stimulate the exudation of oleoresin (Figure 2; Left). Tappers make sure to remove dried leaves, twigs and other ignitable debris found under or within close proximity of the trees to avoid causing forest fires. With proper care, this traditional practice is regarded as harmless to resin trees (Luu & Pinto 2007). The average annual production of oleoresin per tapped tree ranges from 23 to 31 litres depending on the size of resin trees (Samiano et al. 2014). Resins extracted from Dipterocarp trees (Dipterocarpus sp. or Shorea sp.) are collected and sold to middlemen for manufacturing paint or boat sealant, or making torches or varnish. Resins are classified as non-timber forest products class VI (RGC 2005) [According to a proclamation on non-timber forest products by the Ministry of Agriculture, Forestry and Fisheries, Cambodia, non-timber forest products are classified for all forest resources that are not timber, including products from non-timber plants, wildlife, their processed products, and services from the forest. Resin is classified in class VI resin/gum]. According to Luu and Pinto (2007) resin from Dipterocarp trees can be divided into two groups: oleoresin (liquid resin or wood oil) and solid resin (Figure 2; Right). The first person to find and mark a resin tree is considered by village custom to be the owner of that tree. The holding rights of resin trees transfer through generations based on the Phnong’s customary tenure. For example, a father can give resin trees to children when they marry or when the father gets too old and faces difficulty in tapping resin. In cases where the father is too old to tap resin, the share of income from resin trees between children and father depends upon their agreement. Village members recognize resin trees as private property, which makes it possible to transfer ownership through sale, inheritance, and donation, or to sell the right to tap trees for specific periods of time (Evan et al. 2003; Tola 2009). Thus, resin trees are a vital source of livelihoods. However, the expansion of economic land concession (ELC) for rubber and other agricultural crops in the province, along with illegal logging, has threatened the resin trees and has tended to have adverse effects on the Phnong’s livelihoods. Economic land concession (ELC) is a system whereby beneficiaries are permitted to lease up to 10,000 hectares of state-owned land for industrial agricultural use for a maximum of 99 years. According to the Law on Economic Land Concessions, which regulates ELCs, all ELCs must meet certain criteria before being granted. These include the completion of environmental and social impact assessments, the provision of solutions for resettlement, and public consultations with stakeholders, including the affected communities. In practice, however, ELCs have been granted without the fulfilment of such criteria (Special Representative of the Secretary-General for Human Rights in Cambodia 2007). According to the Cambodian Center for Human Rights (2016) and Save Cambodia’s Wildlife (2016), ELCs have little or no positive impacts on socio-cultural life, local livelihoods and economy, as perceived by villagers. Moreover, ELCs have severely impacted citizens’ land rights in Cambodia, as in many cases ELC areas overlap with villagers’ farmlands and stands of resin trees. The objectives of this study were to understand the causes of the decrease in resin trees, the effects upon the Phnong’s livelihoods and the ways in which they cope with the challenges. Moreover, the findings from this study are expected to serve as a solution and to support the communities in coping with the challenges they are facing. The studied villages, Laoka and Srey I, are located 6 and 22 kilometres respectively from Sen Monorom, the provincial town of Mondulkiri (Figure 3). Both villages are located nearby the Phnom Prich Wildlife Sanctuary. In term of households and population, Laoka village consists of 273 households with 1,280 people, while Srey I village consists of 133 households with 570 people (Ministry of Planning 2014). The main occupation of villagers in both villages is agriculture, and their main products include rice (upland rice for Laoka village and paddy rice for Srey I village), cassava and vegetables. After consulting governmental and non-governmental organizations working on forest management and livelihoods in Mondulkiri, several villages were proposed to be studied. However, considering accessibility and time limitations on field trips, Srey I and Laoka villages were selected as the most accessible villages that produce a constant amount of resin for the market. Aside from practical reasons for conducting research, both villages are known as big producers of liquid resin in the Sen Monorom district. 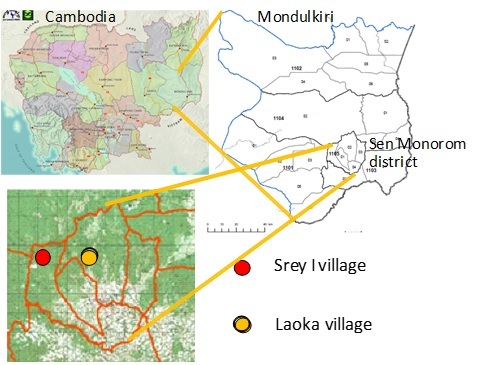 Semi-structured interviews and focus group interviews with resin tappers, resin traders and community leaders (including leading persons in community forestry), as well as on-site observations were conducted twice for each group in these two villages between November 2014 to August 2016 (Figure 4). In order to understand the importance of resin trees for villagers’ livelihoods, questions were prepared for each interview group. 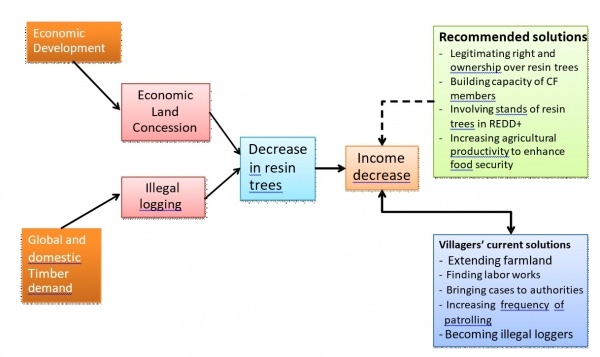 Questions for resin tappers included those on the number of resin trees per household, rights over resin trees, distance from village to resin tree stands, average amount of resin collected annually (Figure 5; Left), and average annual income from resin, as well as questions on perceived threats to resin trees and ways of coping with threats. Questions for resin traders included those on the amount of resin (liquid and hard resin) purchased and sold annually, price, customers and utilization of resin (Figure 5; Right). Questions for community leaders included general information on villages, forest resource utilization and management in the village. For cross-checking information, questions on perceived threats to resin trees and ways villagers cope with threats were asked to community leaders as well. The average annual income from agriculture of villagers in Laoka was 400 to 600 USD per household, and the average annual income from non-agricultural activities (hired labor, resin collection, collection of wild honey or other NTFPs) ranged from 600 to 1,000 USD per household. Meanwhile, in Srey I village, the average annual income from agriculture of villagers was 600 to 700 USD per household, and the average annual income from non-agricultural activities was around 1,000 to 1,200 USD per household. Regarding the number of resin trees owned per family, in Laoka village, villagers reported that around 120 families in the village own resin trees. The number of resin trees own by each family varied from 30 to 250 trees. The reason for the difference in number was explained by villagers—the first person to spot a non-tapped resin tree and start to collect resin from the tree retains rights over it according to village custom. This custom is similar to the studies of Evan et al. (2003) and Cheetham (2014) that examined the rights over and ownership of resin trees in the Seima Protection Forest. Families that have lived in the village longer than others tend to own more resin trees than the ones that moved into the village later. The same reasons were also given by villagers in Srey I village, where the number of families owning resin trees was around 60, and the number of resin trees owned by each family varied from 30 to 150 trees. The variation in number of resin trees owned by families was proportional to the amount of income generated from resin, which varied greatly from USD 125 to 1,620 per year. Income was calculated from the amount of resin collected and sold for one year. According to information gained in interviews, liquid resin is the most important source of cash for villagers in both villages. The proportion of income from resin in both villages contributed to between 20 to 60 percent of income from non-agricultural activities. In Laoka village, during the approximate four to five months each year that villagers face rice shortages, income from resin serves as their safety net. For Srey I village, the rice shortage period is around two to three months. This shorter period is explained by the fact that Srey I villagers grow paddy rice that has a higher yield than upland rice. Aside from buying supplementary rice, cash from the sale of resin is spent on farm machinery or vehicles for transportation, or added to savings. As previously mentioned, the rights over and ownership of resin trees are transferred across generations by customary rights; however, these rights are not yet legitimated. Recently, the number of resin trees belonging to villagers in both villages has been decreasing. There are two main factors contributing to the decrease in resin trees as reported by villagers. One is the expansion of Economic Land Concession (ELC) and another is illegal logging. There is a discrepancy in the data on the number of Economic Land Concessions granted in Mondulkiri. In 2012 the Ministry of Agriculture, Forestry and Fisheries, Cambodia reported that 14 companies received ELCs from the government with a total area of 101,036 hectares. However, data from Open Development Cambodia showed there to be 31 companies that received ELCs with a total area of 208,510 hectares (Lim & Theng 2015). Although the figures from these sources are different, data on land disputes in the province showed that out of 15 land disputes reported in 2013, 12 cases were caused by ELCs (Lim & Theng 2015). ELC areas have often overlapped with forest lands, agricultural lands, and village cemeteries, and have even overlapped with protected areas such as the Phom Prich Wildlife Sanctuary or other protected forests. Villagers reported that the ELC areas overlapped with some of their stands of resin trees. In many cases, companies cleared granted forest land that included resin trees, and similar incidents have also been found in areas of the Seima Protection Forest and other provinces (Cheetham 2014; Tola 2009). Since the rights over resin trees are not legitimated, villagers have found it difficult to get compensation for the resin trees that are felled by companies. In some cases, companies keep the stands of resin trees that belonged to villagers; however, to access the resin trees, villagers have to get permission from the company’s security guards to enter the ELC area for collecting resin. Aside from ELCs, illegal logging is one of the threats to resin trees. Many Dipterocarpus alatus trees, the main source of resin, were cut due to a high demand for construction material and furniture (Evan et al. 2003; Tola 2009). Superior quality trees such as rosewood (Dalbergia cochinchinensis), Afzelia xylocarpa or Pterocarpus macrocarpus have been illegally logged and exported to Vietnam under a timber trade network involving corrupted officials both in Cambodia and Vietnam (Environmental Investigation Agency 2017). Meanwhile, illegally logged resin trees, especially Dipterocarpus alatus which is regarded as inferior wood (Class II) (Forestry Administration and Wildlife Conservation Society 2008), have been used domestically to make furniture or for construction. Several villagers reported that their resin trees were cut by illegal loggers (Figure 6). One villager who owns 130 trees reported that between 2012 and 2017, he lost around 30 resin trees to illegal loggers. According to focus group interviews in both villages, over the past five years, the total number of resin trees lost by owners is over 200. The loggers were mentioned to be villagers from other villages, which are infamous for illegal logging, and workers at ELC companies. The loss of resin trees has severely affected the livelihoods of villagers as resin is their main source of cash. In focus group interviews, villagers reported that between 20 to 60 percent of income was lost due to the loss of resin trees. When the main income of households is decreased, villagers struggle to find cash to buy rice during rice shortage periods. Moreover, there is less or no money to invest in agriculture, to go to the hospital or to save for their children’s education. Due to limited alternative livelihoods, some villagers have decided to extend the area of their upland fields in order to gain more income. However, due to restrictions on protected areas nearby their villages—namely the Phnom Prich Wildlife Sanctuary—only a few villagers have succeeded in expanding their farmlands. Moreover, traditional agricultural practices have been linked to low productivity and low revenue. Some women reported that they tried to grow more vegetables to sell in the local market in order to gain more income; however, the income still could not compare with the amount of money they used to get from resin. It was reported that some villagers looked for labour work in ELC companies, on large agricultural plantations or in Sen Monorom town, especially young males from Laoka village that is located only six kilometres from the town. However, finding work was not easy because most farm work is seasonal and construction work in Sen Monorom requires at least low-level construction skills that many of the villagers from the studied villages are lacking. There were attempts to bring the cases of illegal resin tree logging to the attention of forestry administration officers or police. However, villagers reported that their complaints were rejected by the authorities. The villagers mentioned that the authorities ignored their cases due to lack of evidence and documentation of resin tree ownership. After cases were ignored, villagers reported that they felt it is pointless to bring cases to the authorities. These incidents made villagers lose their trust in law enforcement agencies and the forest management system. Some stands of resin trees are located in areas of community forestry (CF). Villagers reported that they tried to increase the frequency of patrolling in community forest areas after the illegal logging of resin trees was reported. However, most illegal logging occurred in the rainy season when villagers were busy with their farmlands; hence, the patrolling team could not suppress the illegal logging activities as expected by villagers. Similar incidents were also reported by RECOFTC (2016), noting that CF members had limited capacity to involve forest law enforcement. Moreover, the average distance of resin trees from the villages is around 10 kilometres; thus, it was not easy for villagers to always keep watch over the resin trees. Although not mentioned by villagers in individual interviews or focus group interviews, according to interviews with community leaders, some villagers who lost their income from resin became illegal loggers themselves. In order to cover household expenses, some villagers have engaged in illegal logging activity since it is easy to earn money through such activities, although they are risky and illegal. From the results of this study, it can be concluded that resin trees, a vital source of the Phnong people’s livelihoods, are under threat (Figure 7). The decrease in resin trees has strongly affected the livelihoods of people who depend heavily on income from resin tapping. A lack of resin trees means a lack of a safety net for the Phnong. Their solutions to this challenge, as mentioned in the previous section, have been only short-term, and have proven ineffective and unsustainable. Some solutions chosen by villagers have created new problems, such as the expansion of farmland or villagers’ engagement in illegal logging. In order to support the villagers in coping with these challenges in a sustainable manner, collaboration among stakeholders is indispensable. Since the rights over and ownership of resin trees are yet to be legitimated, concerned authorities should support villagers in the legalization of their ownership. Legalized ownership would secure the Phnong’s rights over resin trees and make it possible to bring cases to authorities with evidence of ownership. Community land titling, along with mapping of resin tree stands, are long-term solutions that authorities can provide to the locals to secure their rights over resin trees. With legitimated rights, local communities would be empowered to manage, protect and utilize their resources. Capacity building for community forestry members, especially patrol teams, is also very important. As mentioned by villagers, patrol teams are able to report cases of illegal logging to the Forestry Administration (FA); however, in reality, villagers lack the ability to write complaint reports to submit to the local FA. With this constraint, illegal activities could be neglected. Involving the stands of resin trees in REDD+ programmes is one idea to create income for villagers as well as promote sustainable forest management. Although REDD+ activity focuses on large forest cover areas such as the Seima Protection Forest, there is a successful model wherein smallholders or agro-forestry is joined with a carbon mitigation project (Samek et al. 2011). Moreover, resin trees have a high potential to store carbon, as studied by Khun et al. (2012). Therefore, resin trees could be utilized as a flagship for carbon mitigation initiatives for smallholders. Another way to enhance the livelihoods of villagers is to increase farm productivity. Traditional agricultural practices, including slash and burn and rain-fed farming, are linked to low productivity and rice shortages. Multi-cropping or agro-forestry systems that enhance productivity and soil fertility should be introduced to villagers in the studied areas to enhance livelihoods and food security that have been damaged by the loss of resin trees. Saving resin trees not only has implications for conservation of trees and nature, but also conserves and supports the livelihoods of indigenous people who depend heavily on the resin trees as their safety net. Without support from related organizations and authorities, the future of these vulnerable people in Mondulkiri is insecure. This study was conducted during the field activities of a programme on promoting sustainable utilization of natural resources through the conservation of Satoyama landscapes in rural areas of Cambodia in 2014 and the reforestation activity in Mondulkiri on 2016. The program was funded by the AEON Environmental Foundation and the National Land Afforestation Promotion Organization, respectively. The authors would like to express their profound gratitude to the foundations and villagers in the studied villages who provided information for this study. Baird, I 2009, Diperocarpus wood resin tenure, management and trade: Practices of the Brao in Northeast Cambodia. VDM Verlag Dr. Muller Aktiengesellschaft&Co.KG, Germany. Cambodian Center for Human Rights 2016, Access to collective land titles for indigenous communities in Cambodia, Phnom Penh, Cambodia. Cambodian Demographic and Health Survey (CDHS) 2006, Cambodia Demographic and Health Survey 2005, National Institute of Public Health, National Institute of Statistics and ORC Macro, Phnom Penh, Cambodia and Claverton, Maryland, USA. Cheetham, S 2014, Tapping for change: Investigating the dynamics of resin tapping in Seima Protection Forest, Cambodia, Imperial College, London, U.K.
Corlett, R & Primack, R 2005, ‘Dipterocarps: Trees that dominate the Asian rain forest’, Arnoldia, vol. 63, no. 3. p. 2-7. Environmental Investigation Agency 2017, Repeat offender: Vietnam’s persistent trade in illegal timber, Environmental Investigation Agency, London, UK. Evan, TD, Piset H, Phktra P & Mary, H 2003, A study of resin-tapping and livelihoods in Southern Mondulkiri, Cambodia with implication for conservation and forest management, Wildlife Conservation Society Cambodia, Phnom Penh, Cambodia. Forestry Administration and Wildlife Conservation Society 2008, A study of the Cambodia timber trade: Market analysis for the commercial community forestry project, Forestry Administration and Wildlife Conservation Society, Phnom Penh, Cambodia. Kamnap, P & Sambat, N 2009, Land Suitability Evaluation for Sustainable Agriculture Development Pichrada District, Mondulkiri Province, WWF Greater Mekong Cambodia Country Programme, Phnom Penh, Cambodia. Khun, V, Lee, DK, Hyun, JO, Park, YD & Combalicer, MS 2012, ‘Carbon storage of Dipterocarpus tuberculatus, Terminalia tomentosa and Pentacme siamensis in Seima Protection Forest, Cambodia, Journal of Environmental Science and Management, Special Issue no.1, 2012, p. 68-76. Lee, SS 1998, ‘Root symbiosis and nutrition’, in A review of Dipterocarpus: Taxonomy, Ecology and Silviculture, eds S Appanan and JM Turnbull, Center for International Forestry Research, Bogor, Indonesia. Lim S & Theng N 2015, Community land registration and economic land concessions in Mondulkiri province, Parliamentary Institute of Cambodia, Phnom Penh, Cambodia. Luu, HT & Pinto, F 2007, Dipterocarp oleoresin in Vietnam and Cambodia: Harvesting techniques, resource management and livelihood issues: A report from an exchange visit to Cambodia, Center for Biodiversity and Development (CBD), Vietnam and NTFP exchange program for South and Southeast Asia, Philippines. Ministry of Planning 2014, Demographic data: Mondulkiri province, Phnom Penh, Cambodia. National Committee for Sub-National Democratic Development (NCCD) 2008, Provincial data book: Mondulkiri, <www.ncdd. gov.kh/images/stories/ncdd//ProvDataBook_E_11_ 2008.pdf>. Viewed on 2 March 2017. Open Development Cambodia 2014, Base map of Cambodia (2014), <https://opendevelopment cambodia.net/dataset/?id=administrative-boundaries-of-cambodia-2014>. Viewed on 5 March 2017. RECOFTC 2016, Assessment report on current practices and constraints for community forestry in forest law enforcement governance and trade (FLEGT) in Cambodia, RECOFT, the Center for People and Forests, Phnom Penh, Cambodia. RGC 2005, PRAKAS on non-timber forest products, Ministry of Agriculture, Forestry and Fisheries, Cambodia. Samek, JH, Skole, DL, Klinhom, U, Butthep, C, Navanugraha, C, Uttaruk, P and Laosuwan, T 2011, ‘Inpang Carbon Bank in Northeast Thailand: A Community Effort in Carbon Trading from Agroforestry Projects’, in Carbon Sequestration Potential of Agroforestry Systems: Opportunities and Challenges, eds BM Kumar and PKR Nair, Advances in Agroforestry 8, Springer Netherlands, doi: 10.1007/978-94-007-1630-8_15. Samiano, FB, Ella, AB, Pitargue, FC, Estudillo, GB, Cortez, RE, Jr. and Domingo, EP 2014, Assessment of the different resin-tapping techniques for Dipterocarps: Towards a sustainable resin industry in Cambodia, Forest Products Research and Development Institute, Department of Science and Technology (FPRDI-DOST), Laguna, Philippines. Save Cambodia’s Wildlife 2016, Impacts of economic land concessions on project target communities living near concession areas in Virachey national park and Lumphat wildlife sanctuary, Ratanakiri province, Phnom Penh, Cambodia. Special Representative of the Secretary-General for Human Rights in Cambodia 2007, Economic land concessions in Cambodia: A human rights perspective, Phnom Penh, Cambodia. Tola, P 2009, Beyond subsistence: Trade chain analysis of resin products in Cambodia, NTFP exchange program for South and Southeast Asia and the Cambodia NTFP working group. Phnom Penh, Cambodia. WWF-Cambodia 2016, A summary of the significant species living within the Phnom Prich Wildlife Sanctuary, WWF-Cambodia, Phnom Penh, Cambodia. Watkins, K, Sovann, C, Brander, L, Neth, B, Chou, P, Spoann, V, Hoy, S, Choeun, K & Aing, C 2016, Mapping and Valuing Ecosystem Services in Mondulkiri: Outcomes and Recommendations for Sustainable and Inclusive Land Use Planning in Cambodia, WWF Cambodia, Phnom Penh, Cambodia.